One of the most important prerequisites for doing what matters (and making it pay) is planning. Although I do most of my work on the computer, I’ve used paper-based planners ever since I was in middle school. I prefer to plan during contemplative time away from the computer, and I’m old-fashioned enough to like having my productive life neatly contained between covers. Traditional three-ring planners do not work well for me, as they are usually too bulky to carry around, so I finally began researching possible alternatives. The most appealing options were the beautiful leather organizers from X47, a German company, and the Japanese Midori Traveler’s Notebook. 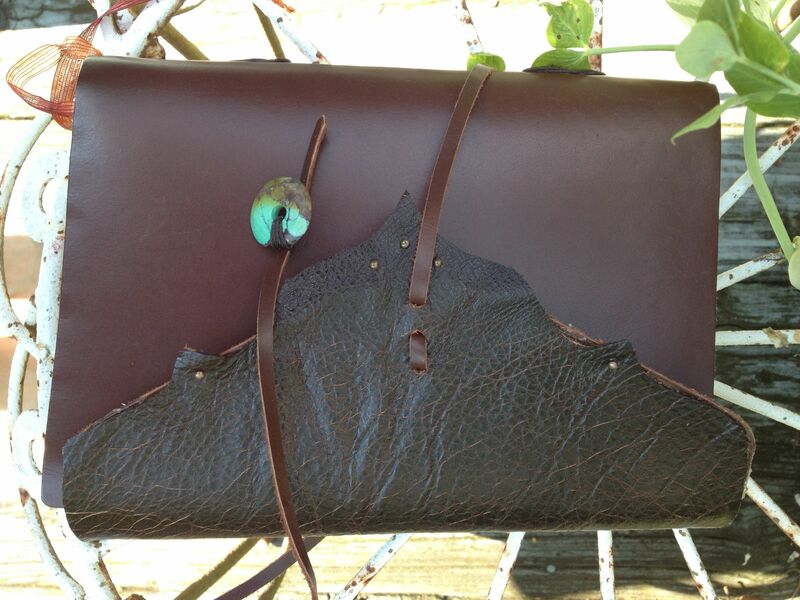 Each of these featured a leather cover and easily interchangeable inserts. Of course, they were a bit expensive, and weren’t exactly what I wanted, so I decided to make my own. I had a tremendous amount of fun with this project, so thought I’d share it here. 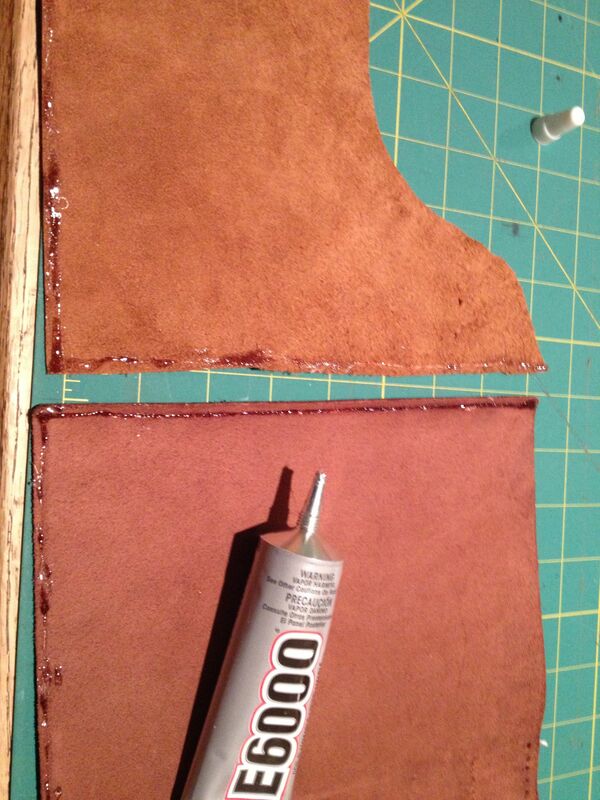 The first step was to make a perfect leather cover. I liked the Midori cover, but wanted a flap closure and an interior pocket. I found the perfect shell for less than $20 in a leather journal from Barnes & Noble. 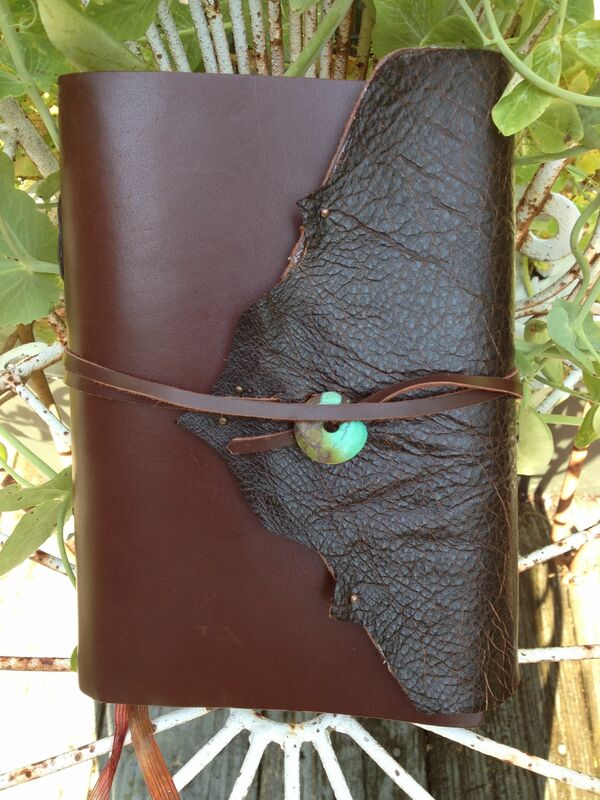 Before: Here is the leather journal I adapted for this project. 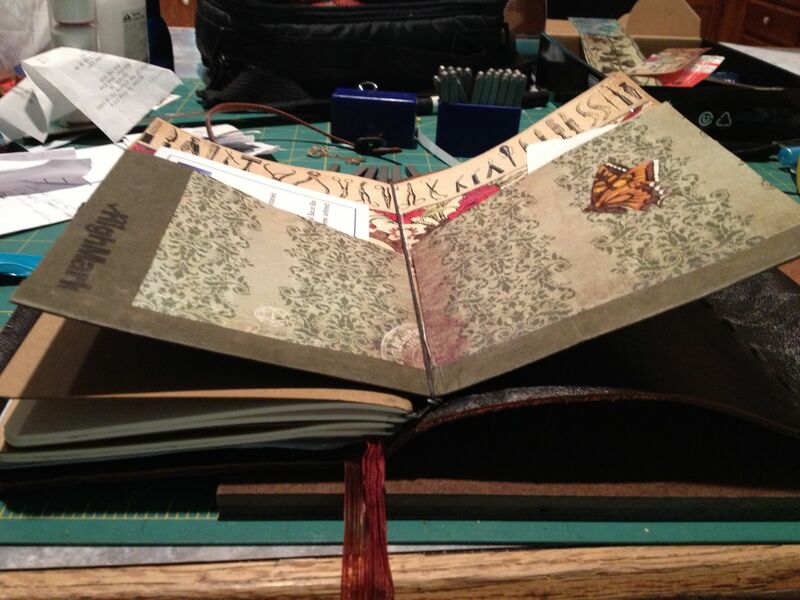 After: Here is the outside cover of the altered journal. It is now a custom planner with Moleskine Plain Cahier inserts and custom pockets. It’s working very well so far, and I plan to make another envelope-style insert plus a permanent master packing list and other custom forms. 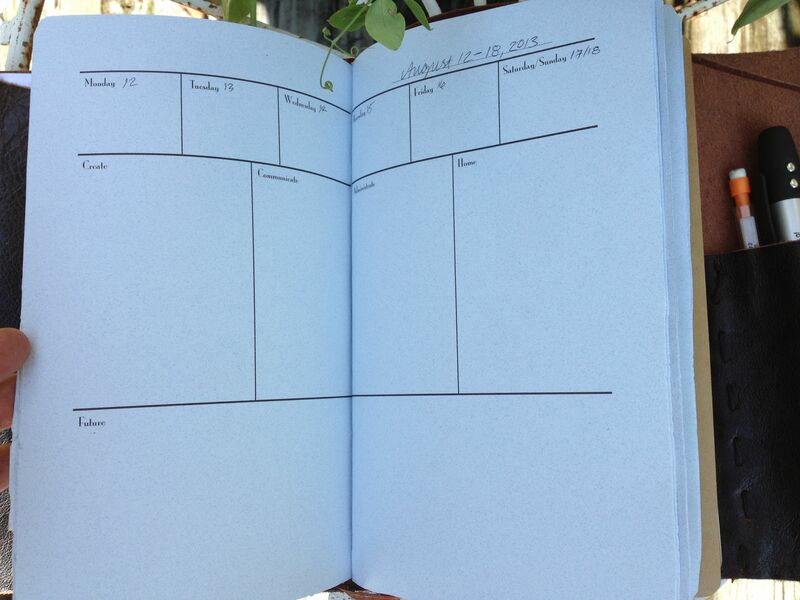 To do a similar project, remove the pages from a purchased journal. Save them, as you can use them later if you like. 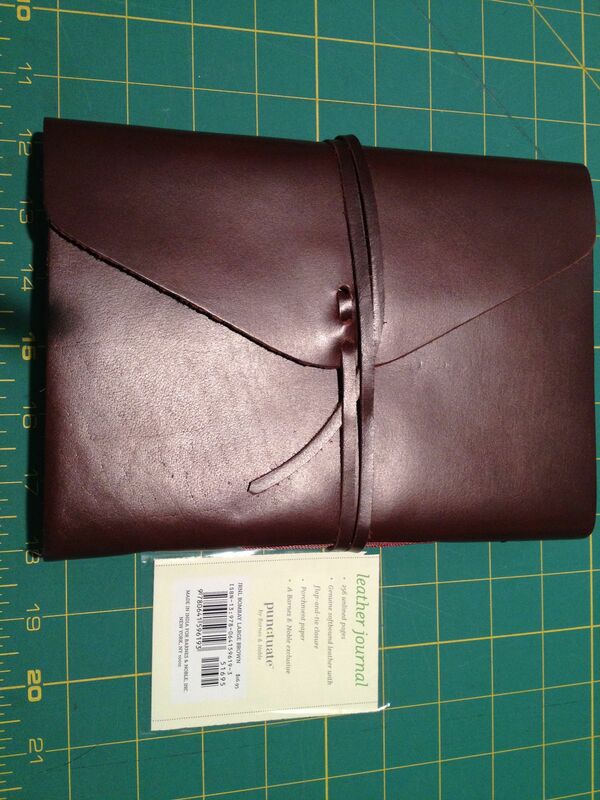 Note that there are no interior pockets in the original journal, and plan to add them if you like. I definitely need pockets! 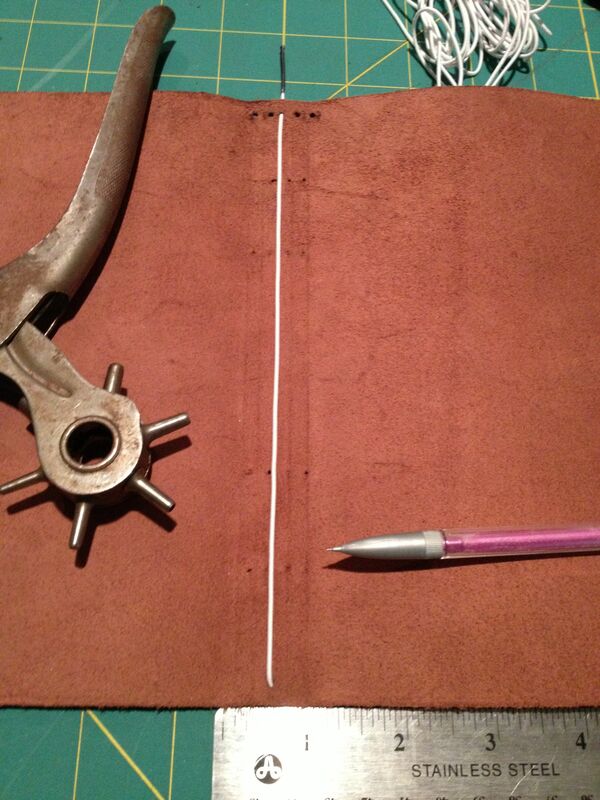 Use a leather punch, awl, or ice pick to make small holes at the top and bottom of the spine. You can find a leather punch at Tandy Leather or Hobby Lobby (use HL’s weekly 40% off coupon to get the heavy duty model for about $13). My old punch is the one my grandmother used for years, so it’s special to me. Remember making paper snowflakes when you were young? Using the same technique, fold and cut scrap paper to make patterns for interior pockets and exterior decoration. Decorating your planner is optional, but half the fun of creating your own organizing tools is making them beautiful and pleasant to use. 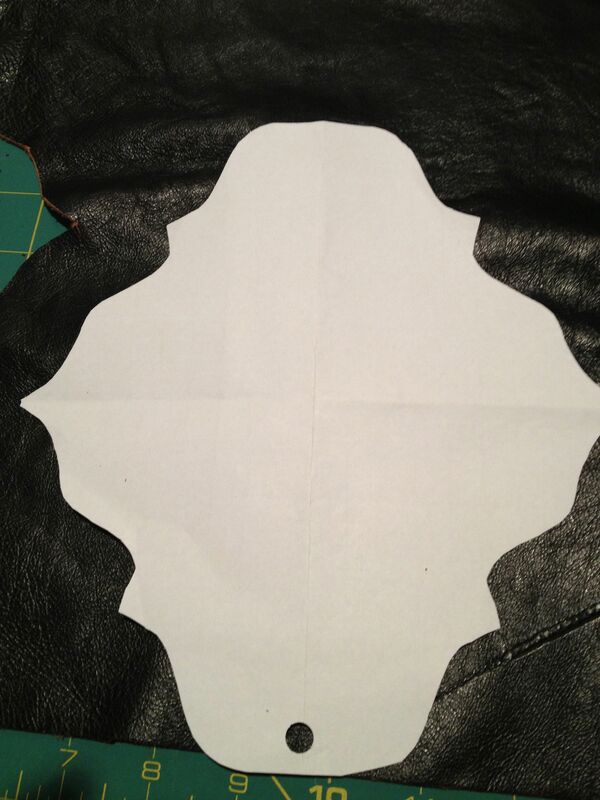 I cut the shape below because it fit my leather and was easy to fold and cut. Oddly, my first thought was to put this over the spine of the book, but as I tried in on, I noticed it fit the flap even better, so that’s where it ended up. 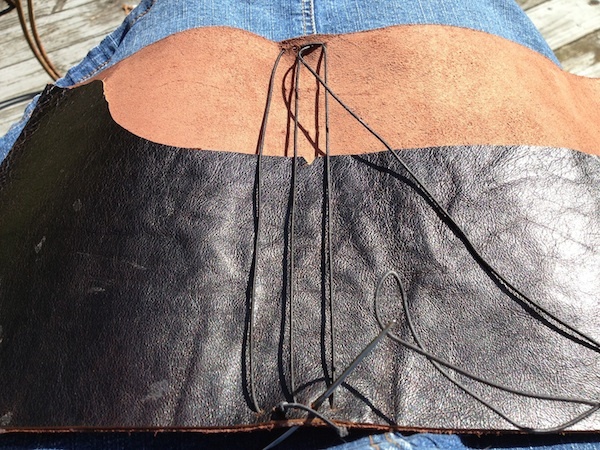 The leather is a swatch I picked up at a Tandy Leather store several years ago. 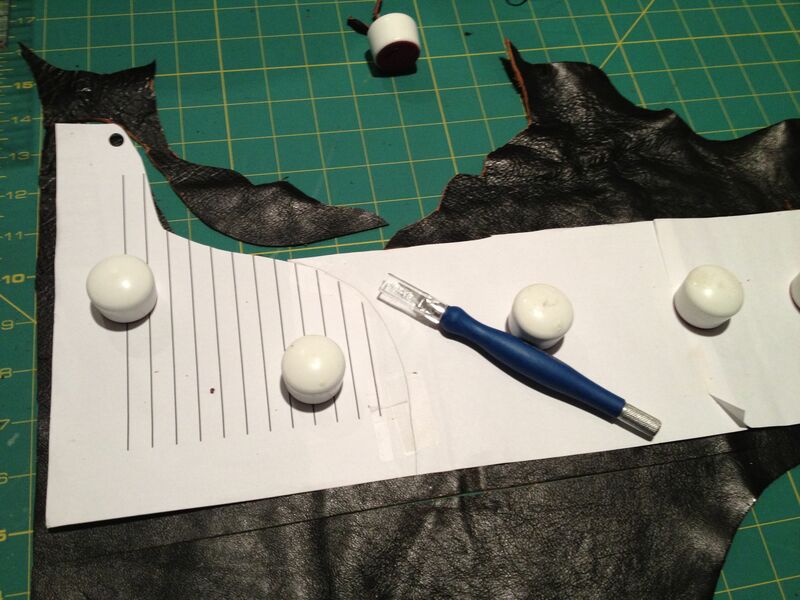 Next, fold one end of the leather insert to make a pen pocket. You can make a smaller loop-style pen holder, but I like to carry one pencil and at least one pen, preferably more, so I made a larger pocket. You can glue or sew it on. I used a leather needle and waxed heavy thread to sew down the edge. 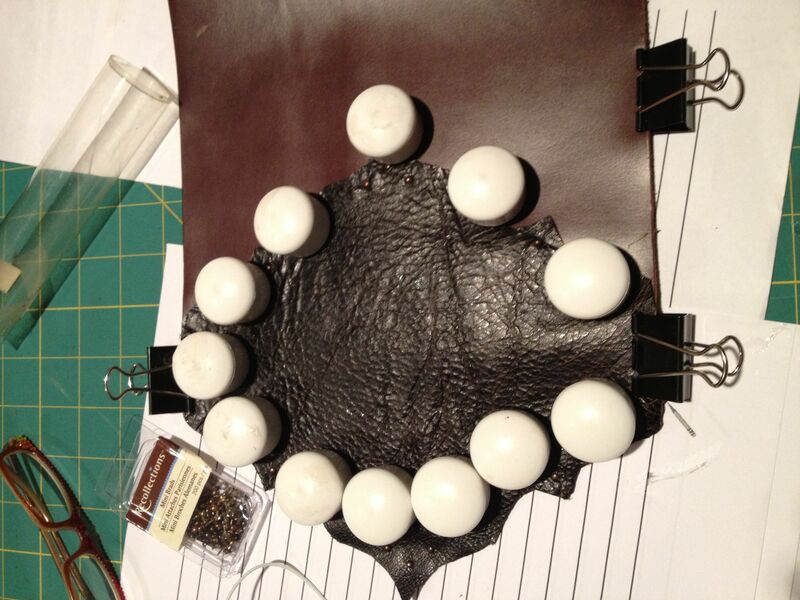 When all shapes are cut, use E6000 adhesive to attach leather to leather. Next, clamp it all around with binder clips and sewing weights and let it dry overnight. Inserts are held in with small round elastic that is threaded from top to bottom. I didn’t have black elastic, and neither did nearby stores, so I decided to dye the white. I used Higgins Permanent Black Ink, which was the only permanent black dye I had on hand. Stretching the elastic around a baking rack keeps it from looking too greyed out when you stretch it in the book. 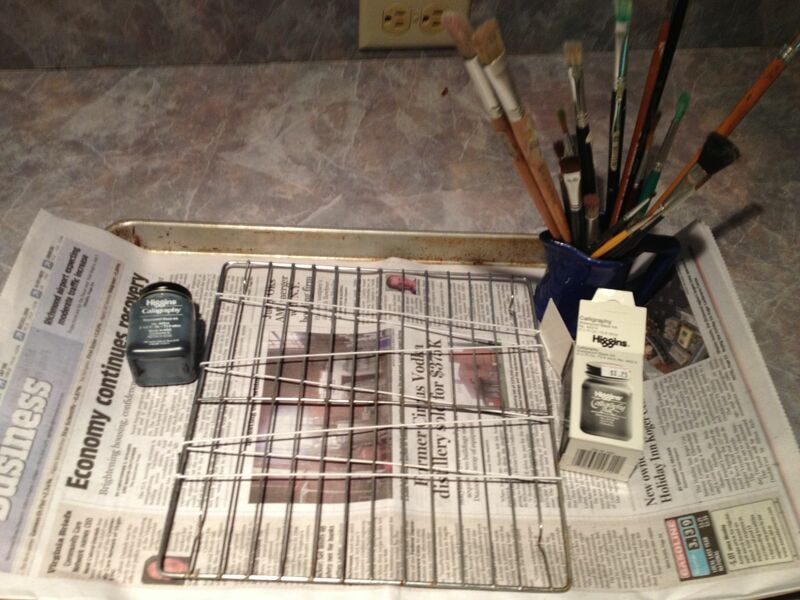 Any old paintbrush or sponge can be used to apply the ink. When the dyed elastic dried, I threaded the leather needle with it, and ran it from top to bottom, creating a total of five strands. Each of these will hold an insert of some sort. On the outside, you see the elastic only at top and bottom, but the full strand is exposed on the inside. At this stage, I also used the heavy waxed thread to make some decorative stitches on the spine, using the holes where the original journal pages had been attached. Next, I wanted to add my name to the journal in a permanent way, so I used letter stamps to stamp my name into the leather under the flap. This is easy– score a light guideline with a pencil, line up the letters you need in the order you want them, then place one letter at a time on the line and whack it with the mallet. I usually do two whacks– one short tap to seat the stamp into the leather, and one harder tap to get a firm imprint. Print off the planner pages you wish to use and fold them in half. I created these week-at-a-glance pages in InDesign and printed them on résumé-weight letter-size paper. I printed about six months worth, folded them (no staples needed), and slid them under the middle elastic band. Use an old file folder or other cardstock to create small pocket files for miscellaneous items. You can find good insert templates at My Life All in One Place. If you prefer Moleskine-size inserts, remember to size these templates to fit the cahier size you select. The folder depicted below was cut from a file folder and decoratively reinforced with card stock designed for scrapbooking. Add the inserts of your choice–I have a lined Moleskine cahier, followed by my datebook pages, a blank cahier, and the card stock folder insert. I put a small yearly calendar in the front pocket so I could see a month at a glance and do long-range planning. 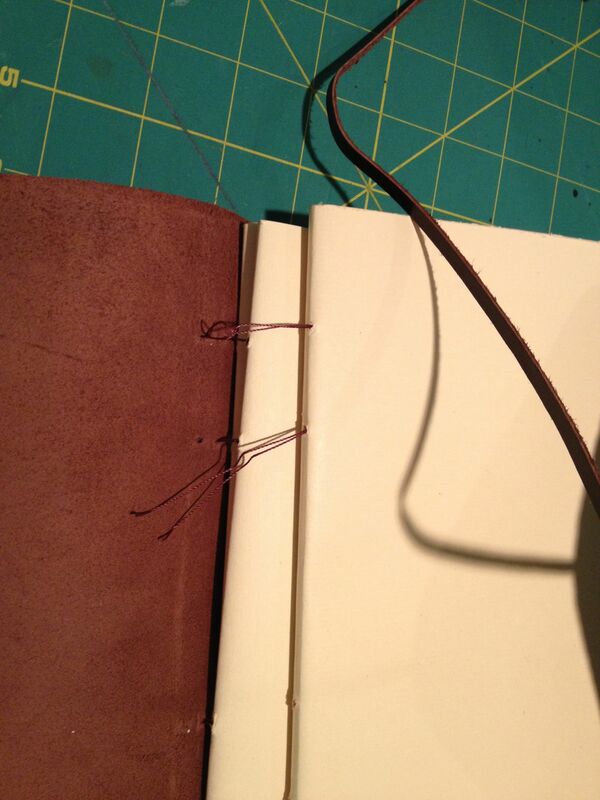 The last step is to replace the leather tie that wraps around the notebook to keep it shut. I added a turquoise stone to it as a decorative touch. Making a custom planner is not only a lot of fun, but also a way to get exactly what you need. You can create a planner with separate inserts for microbusiness, homeschooling, travel, creative journaling, caregiving, prayer, business expenses, and so much more. Try to include only the things you definitely want to carry around all the time, or you may find your planner too fat for comfort. If you make a planner and post about it on your own site, feel free to leave a link in the comments.